When a devastating betrayal drives her from her home, graffiti artist Beth Bradley stumbles into the secret city, where she finds Filius Viae, London's ragged crown prince, just when he needs someone most. An ancient enemy has returned to the darkness under St Paul's Cathedral, bent on reigniting a centuries-old war, and Beth and Fil find themselves in a desperate race through a bizarre urban wonderland, searching for a way to save the city they both love. 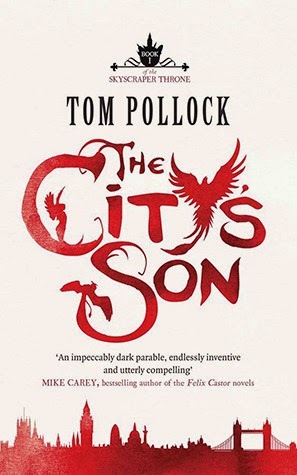 The City's Son was a fun urban fantasy novel, full to the brim with fantastically inventive creations which really capture the essence of London: railwraiths, scaffwolves, Pylon Spiders, the Mirrorstocracy, lamp people, Pavement Priests. It's an emotional read, and at the heart of it, it's about cities and the people who live in it, and the bonds that they form with their city and with each other. Pollock's writing was wonderful. It was richly descriptive and poetic, and he really brought the city and the characters to life. He made the odd choice however of switching between third person, past tense and first person, present tense, which felt a little jarring sometimes, and I felt it would have been fine if it had just been third person past tense all the way through. Beth was awesome. She's brave and vulnerable all at once, and she loves her city. I love that this book was about her finding a side to her city that she'd never known about, so that she can love it even more deeply before. I love that this book was about her discovering where she truly belongs: a child of the city, drawing power from its very streets. I love her determination and her fear and how very real she was, just a teenage girl in love with her city, leading an army when she knows nothing about fighting wars, and worried about her best friend. Pen is Beth's best friend. She's a poet, she's Pakistani, she's quiet, and she's a vegetarian but her mother seems to insist on making her lamb samosas as a kind of comfort food. Pen was my favourite character and I was sad that she didn't really get to do that much in this book. But what she did do was amazing. She suffers quite horribly in many ways; it hurt me to read about it, but I loved her for the admirable strength that she displayed. Her character arc is painful but beautiful. Never fear though, because the next book IS ALL ABOUT PEN, and I cannot convey to you my excitement about this. PEN!!! ALL PEN ALL THE TIME. I loved so many of the more minor characters too! Filius' best friend Electra, a brave lamp girl who dances with him and cares deeply for him; Victor, an old Russian homeless man who knows the language of the lamp people and joins the war, vowing to protect Beth; and Beth's dad, who completes his own personal journey through the course of the book and realises once more the strength of his love for his daughter when he has spent the past few years neglecting her. It's a shame I never fell in love with Filius in the way Beth does, but who knows, you may like him more than I do. The City's Son is delicious and truly urban fantasy which makes wonderful use of its setting and explores what cities really are. If you like urban fantasy, you should definitely check this book out! I hadn't heard of this book before, but it sounds really interesting. Glass skinned dancers? I'm intrigued. THE SECOND BOOK IS LIKE, 10000000x BETTER SO EVEN IF THE FIRST BOOK DOESN'T GRAB YOU, IT'S WORTH IT FOR THE SECOND ONE. Honestly, I was soooo engrossed by the second book. The first one dragged a bit, Filius is a bit meh, Beth is pretty awesome, but nowhere near as great as Pen. Pen is brilliant. But all the stuff that Pollock does with the urban setting of London was just so cool and imaginative. I really loved that part of it.